We’ve combed through Southern and East African game reserves to find 15 safari lodges that include an extraordinary way to experience safari: plunge pools. Each of these lodges features pools designed to place you as one with the surrounding bush, providing the unmatchable combination of being within meters of wildlife, while enjoying 5-star luxury. Choose from several suites to get a private plunge pool with views of Victoria Fall’s distant spray. The honeymoon suite boasts a particularly special pool on the private deck. Suites at Kapama Karula have private pools on each deck, with views into the African bush. The pools are heated during winter months, so lounging poolside while looking for wildlife is a year-round activity. Mere feet from the Sabie River in Kruger National Park, these magical private pools sunk into wooden decks provide plenty of ambience with a side of game viewing. Located on the Oloololo escarpment of the Great Rift Valley, Kichwa Tembo Tented Camp offers stunning vistas of Kenya’s Maasai Mara. With atmospheric lanterns, relaxing in this pool during sunset is an extraordinary way to look out at the plains with its roving game. In the northeast of Sabi Sands Game reserve is Chitwa Chitwa, a luxury lodge with private decks featuring plunge pools and rim-flow pools with views on the lake and its cavorting wildlife. Ghoha Hills lies on an elevation in Chobe National Park, and the entire lodge is run purely on solar energy. This pool deck, punctuated with tall trees, blends into the surrounding bush whilst providing the perfect position for spotting wildlife on the expansive plains. In southern Tanzania’s Selous wilderness is Amara Selous. This luxury tented camp looks onto the Ruaha riverbanks, and its turquoise pool is the perfect spot to enjoy the cool waters and roaming game. West of Chitwa Chitwa lies Singita Boulders on the banks of the Sand River. Boulders’ plunge pool, flanked by two trees has the feel of a natural rock pool, looking out onto the surrounding bushveld. The banks of the lower Zambezi are the setting for this spectacular camp and pool. Wildlife comes exhilaratingly close here; watch elephants on the riverbank from only a few hundred meters away. The Motse lodge is located in the Kalahari Desert, placed with a view west across the desert’s vast grasslands. This pool is in a prime location, situated directly opposite a watering hole, attracting regular herds of game. Royal Malewane’s deck is raised amongst the tree trunks; with the surrounding branches and bushveld below, this is an unmatched and relaxing spot in which to lounge in the pool, looking down at animals below. Private plunge pools on each deck make Sasaab a paradise for enjoying game viewing in Samburu National Reserve. 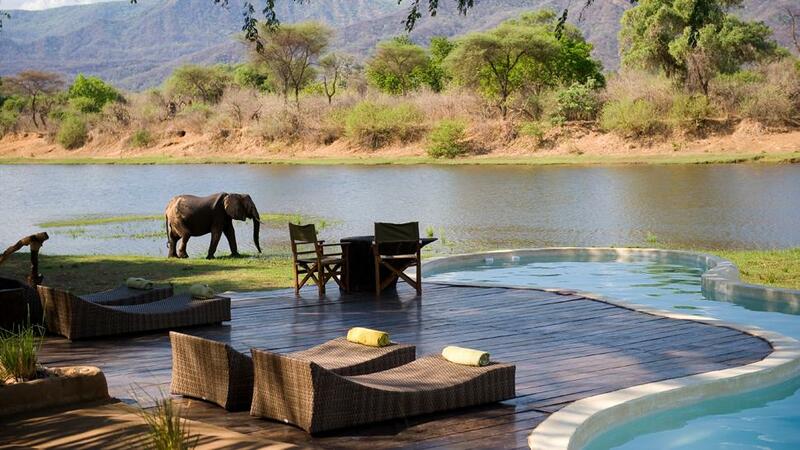 Watch elephants enjoying the river waters below your private deck. Located within Selous Game Reserve, Kiba Point also features private plunge pools with a fantastic outlook on the lake and bushveld. Set amongst boulders on a hill in the midst of the Madikwe Game Reserve, this lodge has a private deck with a plunge pool overlooking the low grassland, a prime spot for animal-watching.